One of the places that I visited in my most recent trip to Israel was the Eretz Israel Museum in Tel Aviv. Among other things, this museum has a nice collection of ancient coins. I was particularly interested in the coin pictured below. The picture is from a postcard from the museum related to a special exhibit. The scan did not turn out at clear as I would have liked. You can see the coin well enough but the writing is hard to read. So this is what it states. Sidon, silver double shekel, 27.63 gms, c. 400 BC. 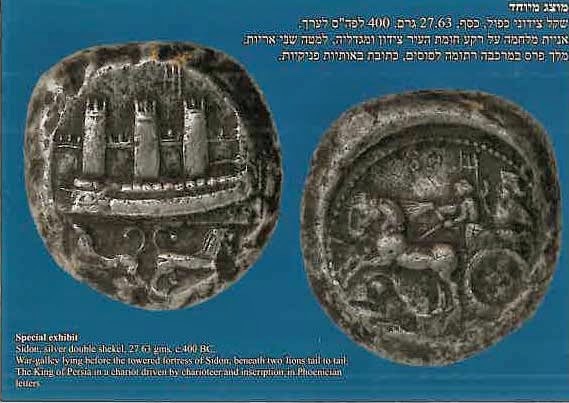 War-galley lying before the towered fortress of Sidon, beneath two lions tail to tail.The King of Persia in a chariot driven by a charioteer and inscription in Phoenician letters. The city of Sidon is mentioned a number of times in Scripture. For example, Ezekiel prophesies against the city (28:20-23). Many Interpreters understand the fulfillment of this prophecy to relate to the conquests of the Babylonians or Greeks. Nonetheless, the Persians also subdued Tyre. This is apparently reflected by this coin.